First of all may we wish you and your family all the best for 2017. Although it is still a few months away we hope you will have a great cruising season ahead meeting both new friends and finding new places to cruise. In the meantime feel free to visit our factory in Maasbracht to see what we are doing ‘behind the scenes’, your welcome to visit almost anytime so do contact your local dealer or our reception to make the necessary arrangements. Amongst the highlights’ will be a look at the progress of the new ‘DOT Zero’ series (35.0 – 40.0 – 45.0). Several of these models will be introduced in 2017 proving yet again another innovative year for Linssen! Perhaps you have seen our video log on Youtube? Here you can follow the progress of the New Grand Sturdy 35.0 AC and Sedan and the Grand Sturdy 40.0 AC and Sedan. In a later stage we will also keep you updated on the 45.0 and 500. In this special edition of the Linssen Magazine, we have new pictures of the ‘Dot Zeros’ in production. 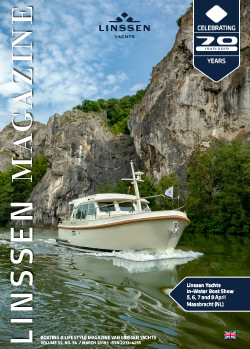 You can follow the progress online (website and Vlog) as well as offline (through the Linssen Magazines). On top of introducing this new model series we are working hard on the development of the new Grand Sturdy 500 AC Variotop. This will be the new flagship of Linssen range, designed, developed and engineered in every detail by us at Linssen it will be the best displacement cruiser in its class – and that’s a promise! This new and exciting model will have many of the ‘good old’ Linssen USP’s but also a lot of new innovations, many of them being presented later in our communications. So keep following our developments and we hope to see you soon in Maasbracht or on one of the spring boat shows somewhere in Europe.